Cherish Each Precious Day: Whew....two days at home!!! Hope you have been patient with my 'missing in action' status. got back home. We're calling this our honeymoon, as we never had one! couples from our Sunday School class! should be enjoying the trip and each other, and did only business that was required while gone. Now, I have two days to wash, dry, and repack my bags, as I leave for Germany on the 11th. I'll be gone May 11-29, and will be helping DD with baby number 2, while spoiling baby #1 rotten! ever done 'solo', so send up some travel prayers for me, please!!! I'll have internet, so hopefully, can pop in and leave some comments for you all. Here's a fun card that I made the last time I had a 'play day' at my friend, Shirleys. What an exciting trip!!!! Wow!!! And now onto Germany! How fun!!! LOVING your card! The colors are gorgeous!!!!!!!!!!!!!!! Good for you Patti! Glad you got away! Have a safe & great trip to Germany! wooow and do you still plan to Europe..
Ohh, a trip. How nice for you. I want to go on a cruise so bad. Glad you had a good time. Enjoy your trip to Germany too. Your card is gorgeous. Love this drape fold. Very nice - and yes the SU papers worked so well with this technique. Glad you had a "honeymoon" and sounds like you had a great time. That is a beautiful card. And, I am so glad you had such a lovely belated honeymoon. Now enjoy those grandbabies too! Get started on the spoiling! LOL Nothing like being a grandmother I think. Sounds like a wonderful time for you and hubby!! Happy Anniversary and enjoy your trip to Germany as well!! LOL!! Enjoy this time in your life!! :) Your card is absolutely amazing with the pretty folds and colors!! Sending hugs and safe travels my friend! Welcome back!!! Your card is adorable. Welcome back and have a safe trip to Germany! I just started making these drape fold cards! Isn't that funny! 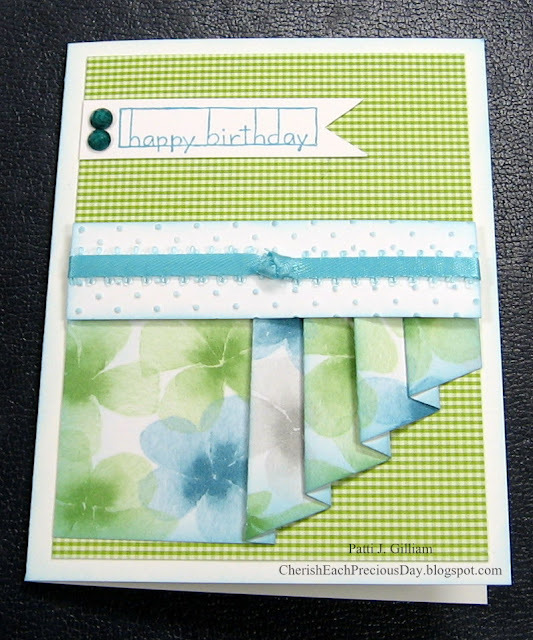 I love the papers you used on your beautiful card! It looks awesome! Have fun spoiling the grandkids! Welcome back and safe trip to Germany. Happy belated anniversary, Patti! Sounds like a very wonderful honeymoon. Have a safe and awesome time in Germany, too! Beautiful card, Patti! You are definitely not letting the grass grow under your feet, but isn't it fun! I'm getting wanderlust as we haven't traveled since last fall. We'll be going to the West Coast in June, so that should cure my symptoms for a while. Have a GREAT time in Germany. Great card, we had a good time crafting that day. Glad you had a wonderful trip, enjoy the grandkids! Very pretty Patti. Love that fold on the bottom. I've been seeing this fold the last couple of days! So neat and unique. It must have been so much fun on your cruise! Good for you! And now another trip! Hopefully you will have a safe trip! Enjoy baby #1 and #2... and the company of your daughter! Well you're certainly well traveled these days Patti, I'm sure you had a ball on your cruise! Safe travels, and enjoy those baby hugs! Oh how beautiful. I will have to go look for instructions on how to do this drapery fold. Looks so elegant. I'm so happy for you. It sounds like you're having a ball. Congrats on your Anniversary!